“The Story” is a compulsive drive I have in many quiet moments throughout my day. When I wake up, I think of scenes from “The Story;” while I’m making coffee, visiting with friends, or working. It’s a permeating obsession that guides me along. There have been days where I haven’t thought of “The Story,” but there will always be little beacons just out of view waiting to be seen. “The Story” will most likely be a series of novels that highlight several years in the lives of the two main characters, John and Trishna, as they go through adolescence and college; with companion anthology short stories written about myriad side characters. Major themes include living with adversities, overcoming adversities, and what we can all do to live better lives for not just ourselves but in relation to others as well. Its world is an amalgamation of our own with its best and worst elements amplified somewhat for dramatic effect, taking place between the mid-90s and mid-20s, mainly. Nothing in it will be an outright lie. Though exaggerated, any event in “The Story” will be plausible enough to happen in our world. It’s just that having a fictional wrapper around it will prevent the narrative from being bogged down by copyright and concern. I haven’t decided on a formal name for “The Story” yet. That’s why I’ve been referring to it as “The Story” this whole time, but really, the name isn’t really important to me. I’m not after this project for money. Certainly, I would like to receive a return on investment for all the time I’ve invested in the project so far, but if that money never appears [objectively- hard to track, subjectively- easier than one might think], if success is never afforded to me, if I have to sacrifice even more than I have in order to write it the way it should be written, then I’ll be content. To briefly comment on this: I’m not sure if I’m possessed by “The Story,” in that it’s already pre-written out there, floating around in some ethereal undetectable unknown, where I’m just the medium that was picked to channel this work. I’m sure there’s an argument that could be made for that. I’m just here to write, man. The Characters: There will be two primary characters: John and Trishna. Before writing about both individually, let me write about them together. Both characters appeared in nebulous states while I was in my junior year of high school, as John and “Trisha,” where I almost immediately wrote them in my summer project References – written about a few thousand words from now – and they’ve been persistent imagination muses ever since. Even after I buried them under years of career stress, they’d occasionally peer through the surface in scenes that would play either in my sleep or in quiet moments. They might represent the perfect couple. I’m not sure yet of their greater nuances as they grow old. I’ve had ideas that they’ll grow old together. Some of their timelines have them go off in a particular location and have kids. Other timelines might not be so polite to them. For now, I’m running with that as a defining characteristic of their relationship: that they’re both on each other’s sides and that any arguments aren’t over not seeing eye-to-eye on issues, rather, it’s how one handles or executes the resolution to a problem. If John/Trishna does something dangerous/reckless rather than ask for help, Trishna/John would get mad. Something like that. That level of implied perfection doesn’t mean they’re perfect people, however. They both grew up somewhat isolated. They grew up around people, Trishna more so, which will be described later, but both were unable to form close relationships with kids their own age throughout elementary school and into high school. They were mainly considered outcasts and their school’s social structures didn’t serve them too well, so they drifted onto the Internet (circa the mid-90s) and eventually met over a mutual interest. This will later be highlighted in “The Post,” which is essentially one of the anchor points of the story where they meet, and they meet because they mutually share physical impairments. This isn’t something that I’ll be taking lightly. John and Trishna will be ostracized because of their physical impairments. The world is not an easy place even if you’re completely “normal,” healthy, and in good social standing – it’s even worse, at times, the further you get away from that. That’s not to say that their physical impairments directly caused their decline in social standing, because these characters had already been floating around in that narrative for a good fifteen years, but it certainly didn’t help. But why should this even be an issue? We are still learning to accept people as they are, completely, without judgment toward physical or mental impairment. This is the closest “The Story” will get into modern politics. The modern political climate is rife with debate over human rights, self-expression, and the willingness of the state or society to consider whether or not someone can truly “be themselves” if they have some sort of deviation from the preconceived standard norm. My beliefs within this structure are summarized as: live as you wanna live, so long as you don’t harm anyone else in the process. Who are we, really, to judge whether someone looks, acts, or expresses themselves in a particular way? If we have to work with them, then it’s a two-way street. They have to meet us as we have to meet them. Still, we should be doing more to help others. We should collectively be trying to help others more often. Looking at the perspectives of other people has helped me out immensely, and though I’m certainly no saint in regards to appreciating all people and their lives or how they’ve arrived at where they are, I do my best to consider my faults and the faults of others not so much as failures or shortcomings, but more as obstacles to finding a better reality. After exploring my philosophies on the matter to help with context, let me return to a more direct statement: through studying impairment representation in media, I’ve learned just how limited in scope, and dare I say function, these characters have been. A character in a wheelchair will usually only be a stereotype of some sort, usually never “strong,” and their wheelchair will be one of their defining characteristics. I’d like to break that misrepresentation. Starting with Trishna, she was born with some sort of physical impairment in her left foot that prevents her from walking much at all. She is an ambulatory wheelchair user, in that she could stand and possibly walk maybe one pace with a guardrail or her goofy/trusty service dog, Pollyanna, yet it’s not a feasible or realistic task. Her family is nurturing and supportive, yet outside of this bubble, kids at school are rude and teachers aren’t understanding in terms of how to help her socially. She is also guided by a strong sense of independence, perhaps at times obsessively to the point of risk, in being her own person without needing to rely on anyone else. But there might be times when she is also a lazy or rebellious teenager. I’m not quite sure. Specific character traits shouldn’t be too arbitrary, right? They should be picked up through how they act in certain situations, and since “The Story” is like a constantly-running movie that I always peak in on, I can see how Trishna or John act in certain situations to determine how their personalities work overall, but that “peaking” ability isn’t quite practiced enough, so for now, I’ll keep them with broad character traits to refine later. Next, let’s explore John’s character. John’s upbringing has significantly more conflict. Without ado, his right thumb and pointer finger were burned off, with his right arm being significantly burned, as a result of a traumatic childhood accident of some sort. The “what happened” hasn’t come up yet, and if we think of characters as living entities in some sort of otherworldly location, he hasn’t wanted to talk about it yet. Either because of that event or due to some sort of bad stroke of luck at birth, he found himself in many foster homes in many areas, not quite ever feeling comfortable around anyone. He probably also has that same sense of fierce independence shielding away terrified doubtfulness just underneath the surface. But these are all wild guesses right now. As the main characters, they should be the most nuanced. Other characters around can be less nuanced because sometimes a person we meet in life just fulfills some sort of role or duty within our own narratives. Even the people we grew up with, work with regularly, or get to know over the course of many years have their secrets and sides to themselves that they either don’t share or won’t share with most anyone. That might be why every side character in most any story is often less nuanced and more two-dimensional. How much can you really learn about someone in a ten-minute conversation? This is where “The Story” will shine: developing the Sammohini Arc. Even though John and Trishna are main characters in their arc of “The Story,” they will become side characters in other arcs of “The Story.” In the Sammohini Arc, for example, Trishna’s big sister Sammohini is the main character, not Trishna nor John. Sammohini is the older sister by a few years – not old enough to be relatable, but not young enough to be able to step in and defend her at school. I’ve been writing her stories for over the better part of the last year for this arc, running chronologically concurrent to “The Story,” although I’m not sure where the short stories representing Sammohini’s days working at Eville Medical will align within “The Story.” I have some ideas on where they loosely fit in, but nothing solid yet. This might be how I end up structuring the writing. The short stories I write twice weekly will be in compilations while “The Story” will be written in one go. That will be similar to how I’ll design the characters. I’ve been developing the side characters as I write about them. Both Sammohini and Jane, the other main character of the Sammohini Arc, started off as generic characters, templates for a short story written in 30 minutes to appease a deadline. They were the first characters I really liked and their dynamics worked well against each other, so I figured, why not make them the main characters of this loosely written character arc? It’s been interesting exploring their characters so far. Sammohini is much more open to revealing her insecurities than Jane. In her short stories, Sammohini will often overtalk, overshare, and have an internal monologue running about how she’s feeling related to certain events. Jane explores some of this, but her backstory is more tragic and nuanced, so she hasn’t really shared but some pieces of this puzzle. I was initially planning to write more content about the side characters – they would include other members of Trishna’s family, and maybe others, depending on how much importance I find when I dig into these characters – so, for now, let’s dig more into Sammohini’s character. This is going to be a winding tale. Sammohini’s first year in elementary school was a little rough. She has trouble making friends because she’s really awkward, has a “weird” name, and might have something like diagnosed anxiety or something else. Maybe. In her second year, Sammohini Lanchester sits next to newcomer Jane Lanyard because the students in the class are arranged alphabetically by their last names. Sammohini’s mom always packs more food in her lunch bag “to give to new kids to make friends.” Just before lunchtime, seeing that Jane doesn’t have a lunch bag of any sort, she says “Hey! I have some extra food! Here!” Jane’s upbringing was poor and she wasn’t afforded a lunch bag or even enough money for lunch, so prior to that, she was thinking she wasn’t going to eat at all that day. They become instant friends over an extra peanut butter and jelly sandwich. Maybe later on that day or week, maybe three schoolyard bullies start teasing Sammohini as they did the year before for something like her name or awkwardness, but Jane stands up to them. She gets in trouble, of course, but Sammohini tells her parents about the situation, they call the school, and get it all sorted out. Jane’s parents are either junkies or drunkards or in some terrible place not really suitable for raising kids, so they don’t even really care about her in the first place other than the money they receive for having had her, and so [in a somewhat parallel to John] she quickly becomes attached to Sammohini. This part of the arc is a little fuzzy. At some point, Jane’s parents get into some sort of violent altercation. One or both die or are arrested and Jane moves in with Sammohini’s family. This is probably closer to their high school age because somewhere around this time, their friendship also buds into a romantic relationship. Maybe Jane could have seen enough abuse from her dad toward her mom to not consider having a romantic relationship with men? Maybe she is so infatuated with Sammohini’s friendship that it becomes more so than that? Maybe it was just some sort of natural inclination? Exploring this topic in nuance without seeming weird will take more time, and there will be other characters exploring other aspects of their sexualities in different degrees, so I’ll leave that thought there. They go to college to study computers. Sammohini and Jane decide to go to the same college and get the same degree because it’ll be easier for them to learn the material by having a study buddy. Jane leads the charge in choosing the degree and studying because she’s much more interested in learning computers, whereas Sammohini just tags along because she is kind of lazy when it comes to things like this. They’ll go out frequently, go to concerts, and party through most of their college years, but they end up graduating. Jane lands a job at the Upper Eville Library in the northern part of the city of Eville – this being the primary city, inspired mainly on Seattle, along with other large cities – while Sammohini, later on, gets a job at Eville Medical. All is fine for a little while. I could see this section of the Sammohini Arc intersecting with the College Arc of “The Story,” not just for general career consideration, but because if Sammohini is something like 3 to 5 years older than Trishna, it makes sense that Sammohini would be finding work just as Trishna is thinking about the last pieces she’ll need to collect for her resume before she can find work herself. But Jane will find herself in another terrible situation. Her job will become toxic, her drinking will spiral out of control, and she’ll end up in an accident in some sort requiring hospitalization, medical debts, and the sort of life-debilitating dread that comes from having to deal with all of that. The toxicity of her job will be mostly not her fault, although there are minor elements she could have changed to perhaps – maybe – prevent things from getting so out of control. It’s difficult for her, as it is for all of us that have experienced any sort of lay-off that takes away our career ego, and especially since she has trouble finding work in the computer field, she instead takes the first job she can actually land – being a furniture mover. This is almost all I know about Jane right now. Other than that she has some hidden psychological and mental issues that she doesn’t like to share, maybe not even with Sammohini. Maybe she’s shared some of these details with Sammohini’s parents? Just like in our reality, there is plenty of stigma around mental health issues in “The Story,” and mostly they’re minor enough for Jane to endure, but they might be disruptive enough to cause her issues in some regards? These are points that I’ll still need to explore as I write about her character and throw her into scenarios. Recent short stories of hers that I’ve written have been revealing more of these elements, but at the same time, I haven’t dig into many formal psychological studies to make sure she’s being portrayed realistically, so it’s all just conjecture. Sammohini will also experience hardship. However, hers will be much more controlled. She will learn to overcome some of her social awkwardness as she works at Eville Medical, and controversially, might break up with Jane, hook up with a character that hasn’t popped up too much in my imagination but might be a bigger deal later on – Samuel – and have a child. Controversially because she doesn’t seem to get along too well with Samuel at all, but maybe there’s something more to it than that? This is even more undeveloped territory than before, which is why I don’t mind that these story elements are overly flexible, because how Samuel fits into the narrative isn’t clear yet, but he might be a decisive factor not just in the Sammohini Arc, but in the Chaos Arc that directly breaks the stressfulness yet peacefulness of Sammohini’s job and Jane’s management of debt and future. I have certain storytelling limits in place. Namely, the Chaos Arc. I know roughly how the Chaos Arc will start. Chaos is a character that was introduced in some of Jane’s short stories earlier this year. That “chaos” also refers to the disruption that will happen to Sammohini and Jane’s stability in how they interact with their world, I suppose; if we broadly consider chaos to be any change element that brings us from a stable state to an unstable state and then back again. There will be some necessary change that needs to happen to both characters throughout this arc. To what degree, I don’t know, because, for both “The Story” and the Sammohini Arc, I’m not aiming for the conclusion right now. That would just be an arbitrary point. Whether John and Trishna live happily ever after, break up, or go to war mean nothing unless they are firmly established, not just by characters in their own right through actions of their own influence [per se], but by the opinions and actions of the characters around them. We would root for them to live happily ever after, not just as main characters, but because they treat others well. We might abhor their break up if, within a batch of characters living lives rife with conflict in their relationships, we see John and Trishna’s relationship as a beacon of hope, only for it to fade off because of some irreconcilable action. War would just be some random decision. So I’m writing toward centralized midpoint. I haven’t really decided on how many side characters I’ll either fully or partially develop yet. Part of that is dependent on how influential they are to the narrative itself, or the characters, so there’s quite a degree of subjectivity there, however, there are a few. Trishna will also have an older brother, Fearghal, that hasn’t really seen much development along with her parents, Divit and Brigit. John’s teacher, Mr. Ebersole, will also be a strongly featured side character, although I’m not sure he’ll get his own arc. One side character that will receive her own story arc is Pollyanna. Why an arc about a dog? Why not? The Pollyanna Arc will be a whimsical story about a dog that’s almost aware that she’s a literature character. It’ll be a fun challenge because most of the content within “The Story” might have a slight degree of melancholy to it. John and Trishna aren’t the popular kids at school, they latch onto each other because they both can empathize with what the other has gone through, and both will experience hardships both in college and in “the real world,” in a way. This feels narratively cheap, and might easily turn into sappy clichés, which is why I think it will be a fun challenge and divergence to write about a dog that’s just happy getting treats and running around in a yard. 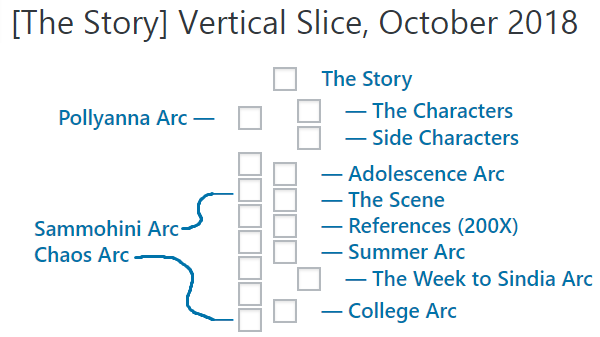 Now, onto the formal arcs of “The Story,” starting with the Adolescence Arc. The Adolescence Arc starts probably around the middle of their middle school years when Trishna reaches out to John in their first instant message communication. They were both frequent members of a message board about videogames, and John had written something either as a topic or a reply about how videogames should be more accessible, which was either written or argued in a way that Trishna found appealing. That she reaches out is almost a shock to John, or maybe the only other instant messages he’d received were from people trying to argue with him over petty things? Either way, they hit it off quickly. They start talking nightly about all sorts of things that teenagers would talk about to each other. They’ll help each other out with their homework, talk about their hobbies, goals, and fears. John will talk with Trishna’s family and siblings, at first because they don’t trust this strange boy that’s calling up their daughter, before realizing he’s not that bad at all. John will move at least once or twice during this process, ending up in the city of Lanada, loosely based on Spokane, Washington, with more deserts and less hope for good work. They will begin talking on the phone after John moves to Lanada – there will be one or two payphones in Lanada that John will use when he can scrounge up some spare change. Here’s how this part will go: in their senior year of high school, with about one month prior to both graduating, John gets into an altercation with not just his foster parents but some bullies at school. The bullies invite him to a party one evening where he gets sexually assaulted and gets a permanent cut on his mouth. He returns back to his house and tries to tell the foster parents, but they either don’t care or don’t believe them, and it escalates to him getting kicked out of the house. He grabs everything of value he can fit into his backpack, including his laptop gifted to him by Mr. Ebersole and a plush that he found at one point before running away. Then the bullies catch up to him on his way to the payphone. I don’t know if he can stow the backpack away before they can catch him or if they break his laptop and try to destroy the plush. Either way, they beat him up really badly before he can get to the payphone, and after calling Trishna to see if she can help him by getting her family to pick him up. On the other side of the phone call, Trishna convinces her dad Divit, brother Fearghal, and maybe sister Sammohini to drive the three-plus hours to pick up John. It’s a long drive in the late afternoon and by the time they find him, he’s already passed out in some heavy rain, so they race back to get him home to medical attention. This might be where I can salvage References. I wrote References during my summer vacation between high school and college. It’s winding, weird, and wild. I had some loose ideas on where I wanted to go with it – a trip through a completely new world to John, here donning the name “everSOL the Valiant” – on his search for “Trisha.” I was unable to complete the work as I had wanted to, owing to a lack of planning and lack of writing ability. A reboot to write it as I had intended would be weird and continuing where I had left off would be an interesting challenge. Or I might just leave it be and proceed to the Summer Arc. This part of “The Story” is where John and Trishna actually meet in person after maybe four or five years of talking via instant messenger and phone calls. This starts the morning after “The Scene,” where John has been unconscious for most of the day after being ‘rescued’ per se and will be more character-focused as we’ll see the nuances of the personalities of John and Trishna emerge. I don’t think there will be any major curveballs in their personalities. Both characters have been straightforward with each other, so the only major hurdle might be just living around each other. Might be easy. Might not. Trishna’s family most likely live on a farm. Having the Lanchester Farm be a central setting will be difficult in some regards because I’ll need to research various ways that farms operate for realism, but will be narratively convenient in many ways. First, the farm gives them something to fill their time on their summer “vacation” of sorts away from school. Second, the farm will be somewhere that John can easily start working since Trishna’s parents will be more willing to employ him than perhaps anyone else. Third, farms still hold this sort of fascination in my mind with being a place where you have to be disciplined and hard working in order to succeed and where is done when it’s done rather than at a pre-set time. Fourth, and originally a subpoint of the previous thought: we are moving so far away from nature in the name of technologies that I’d like to highlight some of what’s good about work that’s not revolved around computers. Time will tell if the farm is really the best narrative choice. Regardless of whether it’s set on the farm or somewhere else, these few months transitioning from high school to college are formative for both John and Trishna. John will have more difficulties, as is usual, such as adjusting to living with a good family and getting all of his the legal paperwork squared away from law enforcement in Lanada. He’ll get his driver’s license, passport, along with any other legal documents like his birth certificate to legally live and work within Eville. There won’t be any crazy, dramatic moments here. I think dramatic elements in rudimentary moments are used to punch up various elements. “Oh no, what if he doesn’t get his passport!” I’ll try to avoid stuff like that, but it also injects a pulse into what could otherwise be some boring plot points, so there is a balance between narrative info dump and hitting all the right notes. If I can be a buzzkill, the Summer Arc will be largely uneventful. Nothing too crazy happens. Everything falls into place for the Week to Sindia… novella? Half of Trishna’s family is from Sindia, a clever spelling arrangement of India and thematically in-line with Eville, Lanada, and Direland: a similar reference to Ireland. At the end of every summer before school, the Lanchester family will fly out to visit their relatives in either Sindia or Direland, and this year is Sindia. This trip will be John’s first airplane trip and reference point outside of the country. (I have no clever wordplay name to obscure the USA yet.) Over the course of a dizzying week, John will soak in as much as he can about Sindian culture while visiting Trishna’s distant relatives. This side story will take broad and specific research to convey correctly. I would rather not pick a random point within India to begin studying as the Lanchester’s Sindian hometown, so part of that exploratory process might be based on what elements I want to convey within “The Story,” with the larger part being actually beginning to research elements like these more seriously. I’ve never been to India, and I wouldn’t even know where to begin, so this is most certainly a milestone point in the narrative, but also, something I might be able to write out of order. Let’s say I’m able to fly out to India for a month within one year’s time. I don’t know if I’d be ready to write “The Story” by then, but I do know that I could cobble together some short stories that could convey… “Sindia” …by then. These are all just arbitrarily self-imposed metrics. Well, that might be explored in the College Arc. I have my four years of academic experiences to draw from, but that is in the computer industry in the mid-2000s, so perhaps there would be value in attending school to learn or reinforce some of these foundational writing skills? Or at least do enough studying between online courses and reading while visiting various universities to build up the world of the University of Eville to then write about it realistically? These are all thoughts that have been racing through my head as I think about the College Arc. A central theme of this arc might punctuate the thoughts of learning about yourself in the Adolescence and learning about others in the Summer Arc, so, learning about the world around us? An adolescent rage is no longer an acceptable option, for example, so it must be replaced with calmly precise actions. These are things that John and Trishna will both need to learn in addition to their academic studies. They’ll also learn to meet more people as well. Between the Accessibility Rights Club, John meeting his first friends outside of Trishna and her family, and Trishna also meeting new people, they’ll become more acquainted with the world outside of the bubble of their compulsory education and people online. They will find the glitter and the grime (a possible title for “The Story”) in life. It may be overwhelming at times. Compared to everything they’d experienced so far, there are real risks of failure both in coursework and other avenues in life, but there are also moments that really shine. It’s these sorts of poignant or powerful moments that are difficult to convey, hard to capture, and what I tend to remember most when I think of literature as a whole. Their graduation is as I typically explore. Everything after that point is dependent on what happens at that point. Does John give up after two-years or does he complete a four-year degree? That depends on how his behavior has been developed and shaped through countless scenarios. If he learns patience and discipline, then perhaps. If he becomes abusive or rude due to continued intolerance, which I don’t see being likely, then no. Their graduation(s) could even be considered the ending of “The Story” right now. There will, of course, be more than that. Whether I like it or not, “The Story” has been sort of a north star for me. When things have seemed uncertain in my professional or social life, there’s always been “The Story” to lean that nervous energy into. Whether the final product is written in a traditional novel format or something more experimental like a series of videogames, it should first and foremost be a solid story. The backbone of “The Story” is the story of two characters, John and Trishna, and how they both come to understand themselves and the world around them. They are not particularly special characters. They may have some driving motivations but they aren’t mythical heroes. They make mistakes and have character flaws that might make them unappealing to some. However, I think that’s what will make them and this story interesting. I’m sick of reading about superficialities and trivialities in fiction and media. Side characters will be terrible yet tolerable. There will be good characters that have done bad things and bad characters with good characteristics. Even John’s bullies will have ample time for possible redemption, even if in John’s eyes, they will never be redeemable. It’s up to the characters to decide their opinions and it’s up to me to write them in a way that will work. Inspirations: I needed a centralized thought dump for my storytelling plans for curious readers. Picture: Screenshots of the major categories, arranged in roughly chronological order. Copyrights: All thoughts shared above contain intellectual property that shall not be borrowed, stolen, or reproduced publically without permission. No character, either in name or personality, is based entirely on anyone living, dead, or fictional.